At one time or another we have all been there. A tough situation has arisen with a family member, colleague or boss and requires a difficult conversation. Rather than having the discussion immediately, we try to avoid it for as long as possible. Or, perhaps, we press forward, hold the conversation and, in the end, we experience increased conflict and negative consequences. Additional stress is added when these conversations impact the direction and quality of your life. How can you circumvent potential pitfalls when difficult circumstances arise? Is there a way to be both competent and confident when addressing tough issues in the moment? Finally, it is possible to hold critical discussions without either party feeling as though they are being judged, taken advantaged of or manipulated? 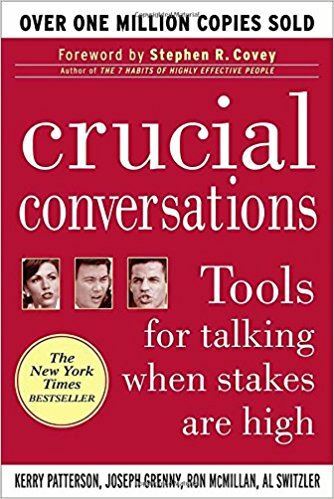 Solutions for those inquiries, along with others, are explored in the updated second edition of Crucial Conversations: Tools for Talking when Stakes are High by Kerry Patterson, Joseph Grenny, Ron McMillan, Al Switzler. The authors begin by defining a crucial conversation as one where opinions vary between parties, stakes are high and emotions run strong. The book systematically moves into the tactics and strategies that can help readers create safe environments for sensitive discussions, focus on mutual purpose and maintain mutual respect during interactions. The authors weave in real world examples and practical exercises to help readers apply each skill as it is presented. Finally, the authors provide additional tools to help transition from successful crucial conversations to action and results. The classic serves as a how-to guide to navigate sensitive, life-altering conversations while maintaining emotional control. Crucial Conversations is not meant to be a one-time read. The sheer amount of content makes it impossible to digest all the helpful nuggets in one sitting. Instead, approach it like a workbook – read one chapter and practice applying your knowledge. The more you read it, the more knowledge and wisdom you will glean from this truly remarkable book. For those of you that have read Crucial Conversations in the past, I encourage you to pick up this updated edition. You will find deeper meaning in the content and acquire additional skills to improve the quality of your conversations for business and for everyday life.